Nerdster Review 2019: Is Nerdster a Good Hosting? Australian-based Nerdster brands themselves as “Australia’s Coolest Web Hosting Company” and they offer extremely powerful VPS and dedicated server solutions with a few attractive (and more affordable) web hosting products. With experience going as far back as 1999 and hosting/domain registration services as far back as 2007, Nerdster certainly has enough experience. They are one of the very few Australian hosting providers considered a leader when it comes to high-performance hosting and server space. Currently, their data centers are still only based in Australia and they provide services in English only. 100% Managed servers: All of their products run on 100% managed servers so that you only need to worry about your website. Magento/WordPress websites: Although they focus on Magento, you could also use WordPress (or other programs with Softaculous) to create your website. Sucuri website security: All plans are protected by Sucuri along with specialized support. You should have an incredibly easy time managing your Nerdster product. They manage the physical servers which means that customers can focus on the actual website management. However, they expect a certain level of know-how from their customers which not everyone might have. Basic: 5 GB storage, 5 GB bandwidth p/m, 2 Databases, 3 email accounts, no dedicated IP address, and limited domains. Business: 25 GB storage, 25 GB bandwidth p/m, 20 Databases, 10 email accounts, one dedicated IP address, and more domains. Basic: 40 GB storage, 40 GB bandwidth p/m, one dedicated IP address and unlimited databases, email accounts, and domains. Add-ons: Addon services include additional emails, IPs, redundancy, and backups, security as well as excess bandwidth, and disk space. VPS Hosting: These Linux-based VPS servers are 100% managed and come in four packages. All products come with unlimited emails and domains as well as superior support. What sets this plan apart is the amount of CPU, RAM, and storage resources as well as monthly bandwidth allocations and dedicated IP’s. You can also add additional resources or Softaculous to install extra features. Dedicated Hosting: These four packages run on fully managed servers with top-end infrastructure. The primary distinction between the plans is the allotted monthly bandwidth as well as resources. They also charge separate setup fees. You can add resources, Cloud Linux, Softaculous, etc. As all their products are 100% managed, you will rarely need technical support for anything substantial. They still offer 24/7/365 technical support with priority support for VPS and dedicated server clients. You can reach support via tickets, email, or live chat. Unfortunately, there is no telephone support. There is a substantial knowledge base for your reference. If you’re based in Australia or need to serve users in the region, you can’t do much better than Nerdster’s VPS and dedicated servers. 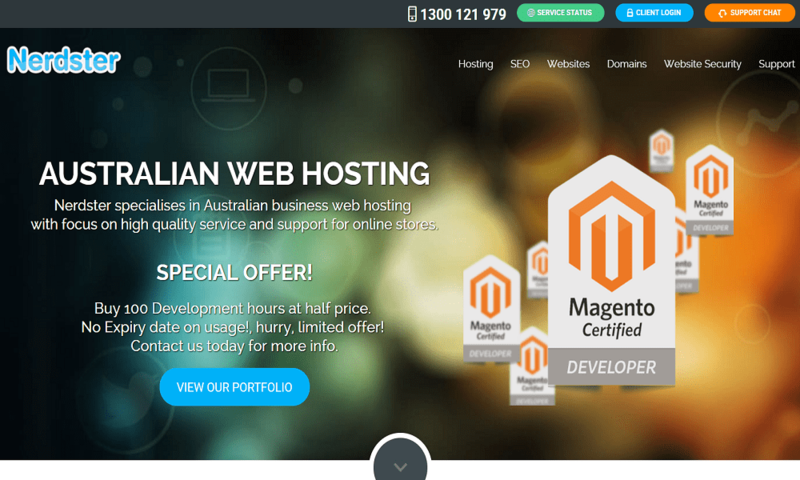 They also offer an extensive range of web hosting products. Wondering how Nerdster stacks up against other Web Hosting companies? Enter any other Web Hosting company and we will give you a side-by-side comparison.